Football is the only youth sport that imposes a weight restriction on Guam and Zach Banner wants to see that changed. 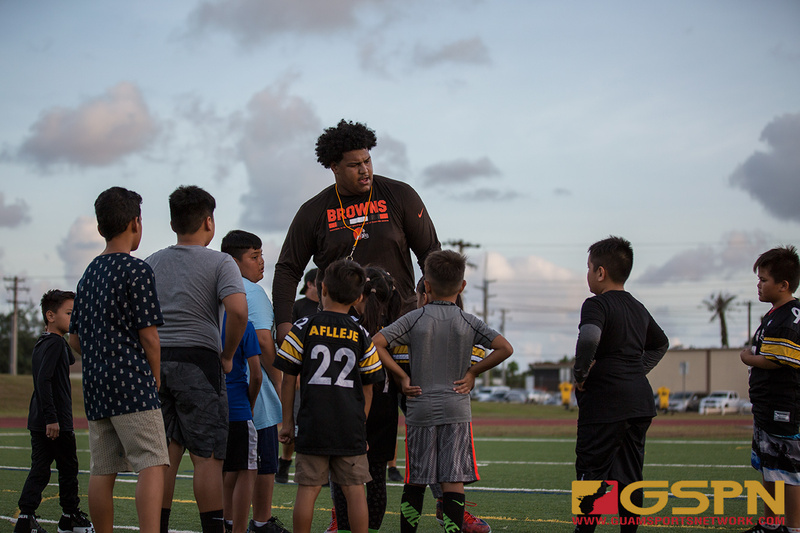 The weight restriction was Banner’s biggest takeaway from his coaches and players camps he held on Guam last month along with fellow Cleveland Browns player Larry Ogunjobi. A league-mandated weight restriction in the Guam National Youth Football Federation (GNYFF) bans heavier kids from playing the sport, leaving most ‘overweight’ players watching from the sidelines and unable to play until high school when there is no weight limit. All other youth leagues on Guam, including soccer and basketball, do not have weight restrictions. Banner understands that the weight restriction has the best intent for the safety of children in a contact sport, however, teaching and coaching the proper way of playing could alleviate those concerns. Banner played youth football in Tacoma, Wa in a league with no restrictions, though neighboring counties did have weight restrictions. The GNYFF is an independent league which mirrors the American Youth Football, a larger stateside organization similar to Pop Warner. League President Ivan Shiroma acknowledges that the weight restriction is in place for safety issues. League Vice President Allen Blend sees the benefits of the ban lift but prefers a careful approach to the issue. Blend, who is also the head coach of the JFK Islanders, says he sees the negative impact on the high school level as most big kids get their first taste of the sport at that level and need to learn the basics of the sport. The high school teams also acquire players out of position as lighter players are forced to play in the trenches in the youth game because of the weight ban. League board member and Guam Raiders President Paul Blas feels that a weight increase and not a total lifting would work best. GNYFF did make a change that it hopes to improve the league as well as assist the high school game and that’s with a new age bracket. So what do you think? Do you feel the youth league should lift the weight ban? Vote on our sports poll on the right of our GSPN website.